Ad-tech companies must address fractures in the digital advertising industry or they will find themselves quickly replaced by others that are willing to play ball. Growing problems include a complex value chain that is siphoning off ad dollars with little transparency or accountability, ads appearing alongside objectionable content, and ad fraud. The winners will be those intermediaries that can continue to demonstrate outsize value in the most transparent manner possible. In the end, consolidation of the value chain is an avenue that many ad-tech companies may pursue. The digital advertising industry continues to grow at a rapid pace as brands look to make connections with consumers and publishers seek to fill expanding inventory. Yet despite this growth, fractures in the industry are increasingly starting to show. A complex value chain is siphoning off dollars with little transparency or accountability. Ads are appearing alongside objectionable content, creating brand safety issues. And fraud, whether due to malicious intent or simply to poor measurement, is creating trust issues. The industry is facing major changes, and successful ad-tech companies will need to fully prepare for the altered dynamics of advertising. Advertising spend in the U.S. continues to recover from the Great Recession, and while spend is not yet back to pre-2008 levels, overall spend across mediums reached approximately $241 billion in 2017. This figure is up roughly 2.4% p.a. since bottoming out at less than $200 billion in 2009. Buried within that figure, however, lies a diverging set of realities: Spend on digital mediums is up more than 16% p.a. 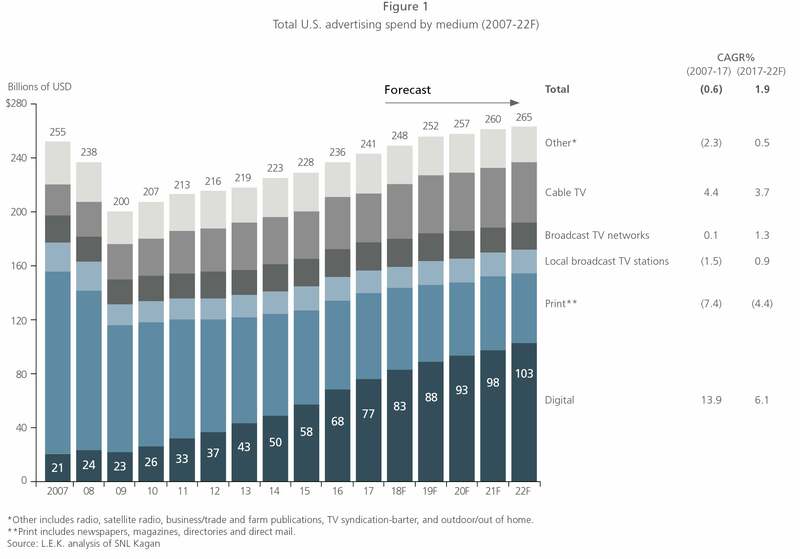 since 2009, while advertising spend on TV, radio, print and other nondigital mediums has declined about 1% p.a. in that same time frame (see Figure 1). Moving forward, industry analysts project the trend will continue, with ad spend on digital mediums projected to grow approximately 6% over the next five years, far outpacing spend on any other medium. To help brands get the most out of their ad dollars — and to assist publishers in selling all of their newfound inventory — a whole fleet of advertising technology firms has popped up, including digital ad agencies, demand-side platforms (DSPs)/supply-side platforms (SSPs) and analytics vendors. These ad-tech firms have certainly propelled the industry forward and helped both brands and advertisers reach the best populations for their offerings. The proliferation of ad-tech middlemen has been especially apparent in the programmatic advertising world, where ad inventory is sold in real time on a scale that is beyond the capacity of all but the most talented and sophisticated brands and publishers (see Figure 2). As the ad-tech industry has matured and advanced, however, it has created an incredibly complex and convoluted value chain that now involves many players wedged in between the advertiser and the publisher. This, in turn, has created numerous problems, chief among them transparency — into where ads are being placed (brand safety), who is actually seeing ads (ad fraud) and what advertisers’ money is really buying them (financial transparency). Over the past few years, advertisers have developed a growing concern about where their ads are placed and what associations this might create for their brands. For example, Verizon and Novartis saw their ads adjacent to hate speech and terrorism-related content on YouTube — a less-than-ideal situation that generates absolutely the wrong kind of brand associations. Many advertisers, wary of facing the same scenario, now take a more active approach in determining where their ads are placed. Chase, for instance, recently adjusted its approach to programmatic advertising, creating a “white list” of approximately 5,000 approved websites for its ads, down from an estimated 400,000 websites previously. Despite the dramatic decrease in the number of approved sites for advertising, Chase claims it has seen little to no change in ad results, suggesting its emphasis on quality rather than quantity is well-chosen. Ad fraud, along with related issues such as poor viewability and inaccurate measurement, represents a second big concern facing advertisers and the ad-tech companies that serve them. The Association of National Advertisers estimated that while ad fraud declined last year, it still represents a huge expense, costing advertisers some $6.5 billion globally in 2017. To combat this loss, advertisers are getting more aggressive about tracking and measuring their ads. For example, Procter & Gamble announced in 2017 that it would require all agencies, ad-tech partners and publishers to enhance the viewing experience, enable measurement and root out fraud. Notably, Procter & Gamble fully endorsed the Media Rating Council viewability standards, which lay out a clear set of criteria that can be used across publishers to determine how often an ad is viewable. Perhaps the worst-kept secret in the digital advertising industry is the fact that only a fraction of every dollar the advertiser spends actually makes it into the pockets of a publisher. Every intermediary in the value chain, from the digital ad agency helping craft the message and campaign to the supply-side tools helping publishers fill inventory, takes a piece of the pie. Ultimately, the publisher pockets just about half of each ad dollar, with agencies and ad-tech companies taking the other half (see Figure 3). Advertisers are starting to wake up to these dynamics, demanding increased transparency into where their dollars are going. For example, Diageo developed a clear set of standards that not only enact viewability standards, but also require fully transparent pricing models from all advertising partners. Moving forward, it’s clear that the economics of the digital advertising ecosystem must change. We are hurtling toward a time when advertisers will not sit idly by as their ad dollars are siphoned off, used for ads placed alongside questionable content or wasted via outright fraud. More and more, advertisers will continue to demand transparency and efficiency from their vendors. Vendors must address these concerns or they will find themselves quickly replaced by others that are willing to play ball. What does this mean for ad-tech companies? Ultimately, the winners will be those intermediaries that can continue to demonstrate outsize value in the most transparent manner possible. Results will continue to drive which vendor gets the business, yet more analysis will go into ROI calculations other than just spend and revenue calculations. Generating short-term gains won’t matter if you are destroying a brand’s reputation over the long run. In the end, consolidation is an avenue that many ad-tech companies may pursue. Consolidating the value chain is a straightforward way to reduce “leakage” of the advertiser’s dollar, achieve greater control of content placement, and gain leverage in negotiations with publishers and advertisers. Notably, some of the strongest players in the space, namely Google and Amazon, have control over large sections of the value chain. And for all the kvetching about working with Google and Amazon, ad dollars keep flowing their way. Yet those that attempt to consolidate the value chain must do so carefully. Ad-tech companies must identify efficiencies and synergies —and develop, vet and enact long-term strategies prior to a deal’s close, lest they suffer the same fate that awaited some prior attempts to link value chain participants. Given the extensive work that must be done to fully address growing customer concerns, ad-tech companies must start the process now; the longer they wait to take action, the more dollars and deals they stand to lose to competitors that are willing to make the necessary leap into the future.